Looking for a thorough grounding in music through piano study? I teach students of all ages to play with proper technique, musicianship and expression. Learn to read music well and develop your life-long skill and passion for the piano. I teach in Cedarburg and in Port Washington. At both locations, two grand pianos side by side are there for my students and I.
I took piano lessons from age 7 through high school. In college, I studied piano with Carroll Chilton at the University of Wisconsin, and spent a year at the Hochschule fur Musik in Vienna, Austria. In 2001 I organized a teacher education program from the Well Prepared Pianist Institute for Milwaukee area teachers, bringing N. Jane Tan, Seymour Bernstein, David Engle and Paul Pollei to our area. About 25 teachers and I worked for over 3 years with these incredible pianists to re-engineer our playing and teaching to new levels. Music should reach the student on an emotional level. They should be excited to play their pieces. I teach a mix of pieces tailored to each student's abilities and interests. Classical music is the most challenging but also the most rewarding music genre for those students who progress with me. But if that music does not speak to the student, I will look for other kinds of music they may enjoy more. Please contact me for more information about lessons and rates. I have taught preschoolers and octogenerians. 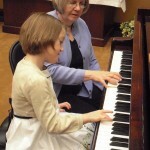 Age is not a barrier to learning the piano. Let others know about Pru Palecek. Did this teacher help you to learn? How long did you take lessons? Are you still playing music? Share any thoughts or stories you have so that others can know about this teacher!